During my most recent move, I observed (while sweating, and swearing, and trying to keep the packing tape from sticking to itself again) that kitchen items occupied more boxes than any other category of my possessions. Not even books could compete with the weight and bulk of my kitchen, from a sturdy stand mixer to far more glassware than any reasonable person should own. It was a vivid illustration of how objects for storing, cooking, and eating food surround us. They are intimately related to our bodies, containing the food that we will incorporate into ourselves; some of them, eating utensils like forks or chopsticks, actually enter our bodies. Kitchen and dining items are powerful, and they are part of us. In my teaching on American food history, I argue that food-related objects offer a rich site of interpretation, as part of my greater mission of teaching with things. Even if I can’t always bring physical objects into the classroom—like gingerbread made according to Fannie Farmer’s 1896 recipe, or a bottle of the Silicon Valley food replacement beverage Soylent—my students engage with visual or material culture in every class. Elaborate tea services illustrate tea’s value as an imperial luxury good for eighteenth century Americans—and emphasize its potency as an instrument of protest in the leadup to the American Revolution. Racist images advertising baking powder and tinned meats in the late nineteenth century demonstrate both the growing business of industrial food, and the ways that stereotypes pervade everyday life, past and present. Trays from mid-twentieth-century university dining halls reveal the shift to military-style dining after the second World War, and the growing concern about public health and nutrition for institutions, governments, and researchers in that period. My students sometimes argue that material and visual culture are more inscrutable than texts, until I point out to them that they are the most visually-literate generation perhaps in all of history, spending hours navigating completely image-based social media applications. And, in fairness to my students, I didn’t encounter material culture as a field of study, or learn about the methodological rigor of art history, until I arrived to my PhD program and studied with an art historian and other scholars of material culture. But why do objects—despite the many many many examples of wonderful material culture scholarship on this site—seem so untrustworthy to students raised on Instagram and Snapchat? The result is a Youtube video called “Do Objects Lie?” In it, Chris and I examine a variety of food-related items, from teapots shaped like fruits and vegetables, to pitchers depicting famous battles; from anthropomorphic teacups to, uh, chamber pots. These objects misrepresent the truth, or leave out important details. These omissions and elisions are, in fact, the most interesting part of the story, enabling us to ask questions about how history is made, how collections and archives are formed, and what these processes can tell us about ourselves. We have to engage mindfully with sources (textual or material), look for as many pieces of evidence as possible, and ask questions about how we know what we know. Teaching these practices to our students has taken on a fresh urgency as issues of history, media literacy, and truth itself dominate the news cycle. I’ll be showing the video as I teach about questions of evidence and interpretation in classes on early American studies, American Studies methods, food history, and material culture. I hope it will be useful to teachers and students across disciplines, from history and art history to food studies and beyond. How might you use this video in your classroom? I look forward to hearing your ideas. Caroline Frank, Objectifying China, Imagining America: Chinese Commodities in Early America (Chicago: University of Chicago Press, 2012), Chapter 5. Kyla Wazana Tompkins, Racial Indigestion: Eating Bodies in the 19th Century (New York: NYU Press, 2012). 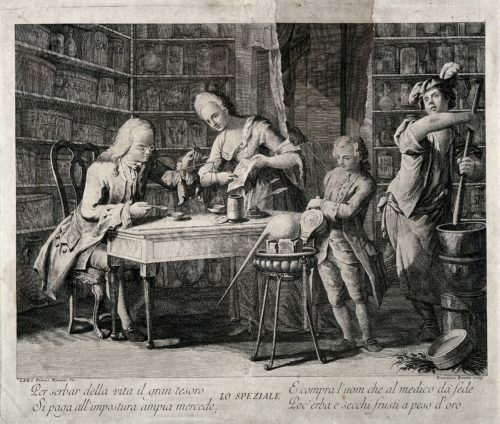 An apothecary making up a prescription using scales, his wife holds a recipe for him and two assistants are working with the bellows and pestle and mortar. Line engraving by F. Baretta after P. Mainoto. Courtesy of Wellcome Library, London. While many of us are sad to see the Summer go, there’s always something exciting about the promise of September. Many of us are reenergized and seeking out new ways to engage students and the public in a range of educational settings. This can include the use of recipes, and since 2014 the Recipes Project has highlighted a number of dynamic ways that our contributors mobilize these sources in their teaching. In this fourth iteration of Teaching Recipes: A September Series, we offer more tips and tools for working with recipes in a variety of settings: high schools, universities and colleges, museums and public outreach programs. This month’s contributors come from a range of backgrounds, and all have had productive educational experiences with recipes as teachers, students, and members of the public. They offer inspiring new ways to incorporate recipes into our work, just in time for Fall. Opening the series, Liza Blake offers step-by-step instructions for hosting a Transcribathon in our classes, including lots of helpful handouts (who doesn’t love handouts?). She provides detailed instructions just in time to participate in Early Modern Recipes Online Collective (EMROC)’s annual Transcribathon, happening this September 18th. Carla Cevasco then asks how teaching food history with material objects can challenge students to think about sources in new ways. As we know, recipes aren’t just about texts, and Carla encourages us to think about the material elements underpinning these histories. Later in the month, Lisa Myers talks about the significance of recipes in her graduate course, “Food, Land and Culture,” describing her mobilization of recipes as stories and Indigenous art. We also hear about the usefulness of recipes from a student perspective. Undergraduate and graduate students Jessica Hutchinson and Samantha Eadie reflect on their experiences developing a major public exhibition on the history of recipes and cookbooks in Canada, Mixed Messages: Making and Shaping Culinary Culture in Canada. Their posts speak to important intersections between graduate training, public history, and outreach. Tiffany Fisk later considers the role of recipes in her training in a five-level apprenticeship in Historic Foodways at Colonial Williamsburg. What these posts make clear are the multiple forms and sites in which recipes transform and enrich educational experiences. Finally, we’ll consider the ways that recipes can play a big role in large-scale institutional developments. Later in September, Jeffrey Pilcher describes the development of University of Toronto Scarborough’s Culinaria Research Centre, showing how, over time, faculty members established a wide-ranging set of programming in food studies, all while retaining a close focus on historical and contemporary recipes. Beth Forrest then considers current discussions in the roles of recipes in education, before offering possibilities for future developments. Whether it’s one-on-one in the classroom or among large groups in an outreach setting, recipes provide educators with means to interrogate the past all while connecting with a range of audiences. These are just some of the reasons why we’re so excited to bring you these posts. We hope you enjoy them, as you bring new ideas to audiences this September. And, as always, we look forward to hearing from you about how you mobilize recipes in your teaching! From the outside, the field of early American studies still looks an awful lot like the Founding Fathers. (Even if they have a catchy soundtrack.) But this white, wealthy, male stereotype is no small source of frustration to those of us who study the global connections and collisions that make up #vastearlyAmerica. As I completed my Ph.D. in May, I’ve been reflecting on graduate (or, for those on the other side of the pond, postgraduate) education. For many people it is an exercise in specialization, a process of narrowing one’s field of expertise. By contrast, I found myself drawn to interdisciplinary research in American Studies precisely because I have too many interests to confine myself to one discipline. So it was with delight that I discovered The Recipes Project, when my colleague Theresa McCulla wrote about a panel we presented at the American Historical Association annual meeting in 2015. An in-person connection led me to this online community. On this site I’ve found a place to share many odds and ends of my research, blogging about blood pudding, baby food, fermentation, teaching teenagers, and gluttony. My work here has also inspired me to write for other public scholarship outlets, such as Nursing Clio and Common-Place. 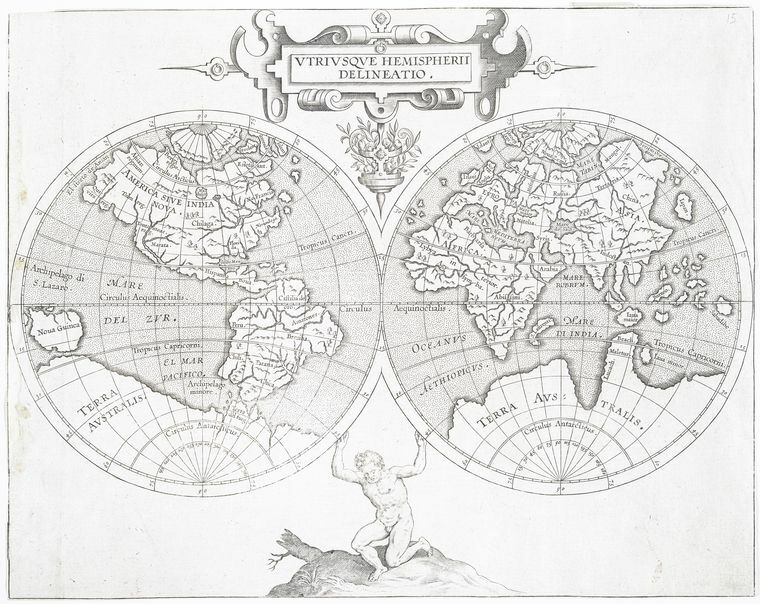 Corneille Wytfliet, Vtrivsqve hemispherii delineatio, 1597. 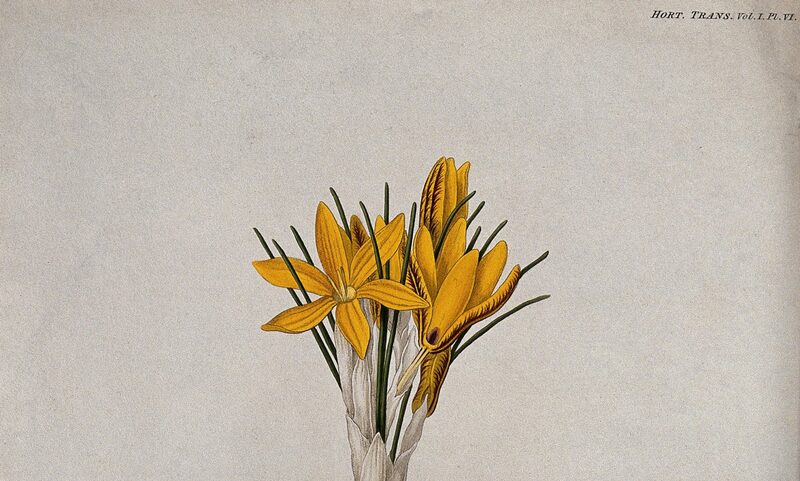 New York Public Library Digital Collections. Image Credit: New York Public Library. The variety does not end there. Where else would I find a post on human taxidermy cheek-by-jowl with an analysis of arranging recipes? The chats with libraries and archives, the teaching series, and the updates on digital humanities projects? The many, many posts on booze around the world? An academic community like The Recipes Project provides a place for the vastness of my own field to meet the vastness of everyone else’s. While blogging about breastfeeding in early America, I discovered other scholars working on breastmilk as medicine in imperial China, and remedies for nursing problems in early modern England and the ancient world. The online community here has in turn facilitated powerful in-person connections. The first time that someone came up to me at a big conference and told me they’d heard about my work before, it was because of a post on this site. That moment of having my work recognized as a junior scholar, that moment of knowing that someone else had found my research compelling, kept me going through the long solitary months of dissertation-writing. And I will strive not to forget that feeling as I become faculty myself. One of the speakers at my commencement ceremony described graduate education as a process of “becoming bewildered,” of learning the limits of what you know. I’ve emerged from an interdisciplinary Ph.D. in the field of vast early America, utterly bewildered. But thanks to The Recipes Project, I know where to start looking as I continue seeking answers. Image Credit: Wellcome Library, London. Massachusetts Puritans had left the Old World in order to found a separatist religious colony in the New. Like many believers, the Puritans worked to interpret their sacred texts into best practices for everyday life. This task meant reckoning with blood-eating, because on both sides of the Atlantic, the early modern English kitchen dripped with blood. A search for “blood” in this site’s archives turns up over seventeen pages of results, including a recipe for pigeon’s blood eye wash! Blood began with animal flesh. 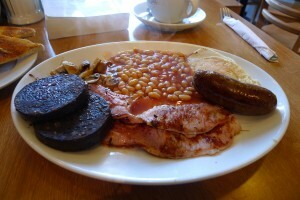 The English prided themselves on meat consumption that visitors found excessive. The wealthy ate numerous kinds and large quantities of meat, and recipes often assumed that cooks would begin with freshly slaughtered but not butchered animals. As Hannah Woolley instructed in a recipe “To Stew Chickens” in The Cook’s Guide in 1664, cooks had to “pull” (defeather) and “quarter” their chickens before washing them clean of blood (57). All this meat-eating meant a lot of blood, and in the kitchen, waste not, want not, which meant that blood played a starring role in some dishes. 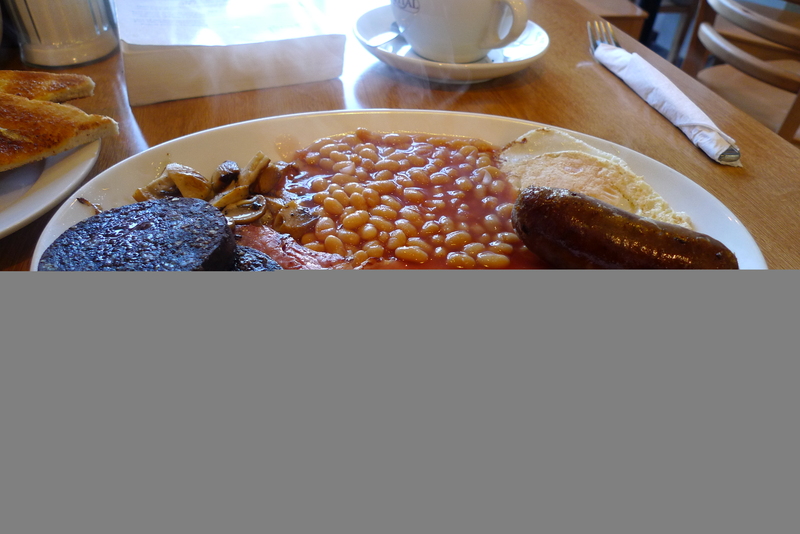 Full English breakfast with black pudding. Image Credit: Ewan Munro, via Wikimedia Commons. Mather’s pamphlet did not mention any specific foods containing blood, but many English cookbooks of the era contained one or more recipes for “black” or blood puddings—a dish that today is much more popular in the UK than the US. Gervase Markham’s version, first published in 1615, called for the cook to soak oat groats in “the blood of an Hogge whilest it is warme,” then after three days, “with your hands take the Groats out of the bloud” and drain them. These gory steps completed, the cook mixed the groats with cream and chopped suet, seasoned with herbs and spices, stuffed the mixture into intestines, and boiled it until solid. (Modern black pudding recipes remain much the same.) While Markham and many others recommended hog’s blood for this purpose, Robert May’s 1660 The Accomplish’t Cook (which reprinted Markham’s recipe) noted that one could adapt it to “sheeps blood, calves, lambs, or fawns blood” as well. Even foods that did not contain actual blood still made reference to blood. One popular red wine based beverage in eighteenth-century America originated in Spanish colonization of the Caribbean. The combination of wine, spirits, sugar, and fruit resembled many other punches of the era. The English called it Sangaree, a corruption of the Spanish word for “bloody,” sangria. 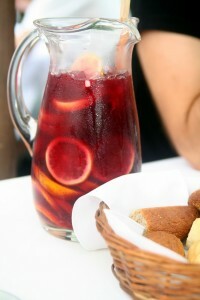 Sangria. Image Credit: Flickr user ilker ender, via Wikimedia Commons. Despite (or because of) its popularity, cooking with or eating blood became the site of debate among some American colonists. 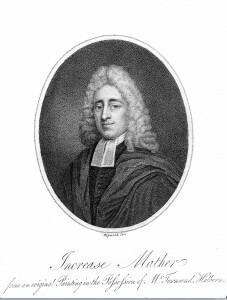 It is unclear exactly what controversy inspired Mather to write his pamphlet, but somehow the everyday consumption of blood had come under scrutiny. Deeply invested in following the Word of the Bible, Massachusetts Puritans struggled to reconcile their culinary tastes for blood with biblical law. To defend culinary blood consumption, Mather noted that other English food preparation methods did not follow biblical prescriptions to the letter. “If it be Lawful to Eat things Strangled,” he reasoned, naming the way that kitchen workers often dispatched fowl, explicitly banned in Acts 15:20, “then it is Lawful to Eat Blood” (4). But most importantly, Mather took the sacrament of the Lord’s Supper as evidence for his case. Mather claimed that the consumption of blood outside of communion did not have ritual significance, precisely because Christ’s blood held such power: “since Christ has shed his Blood, there is no Sacredness in any other Blood,” he concluded (5). The metaphorical consumption of Christ’s blood in the Lord’s Supper rendered acceptable the actual consumption of more mundane blood at dinnertime. Under Mather’s interpretation, blood puddings and other blood-based dishes would have been allowed at the Massachusetts Puritan table. This food historian wonders when black pudding died out in New England, while it remained so popular across the Atlantic. Harriet Ritvo, The Platypus and the Mermaid and Other Figments of the Classifying Imagination (Cambridge: Harvard University Press, 1997), 194-197. 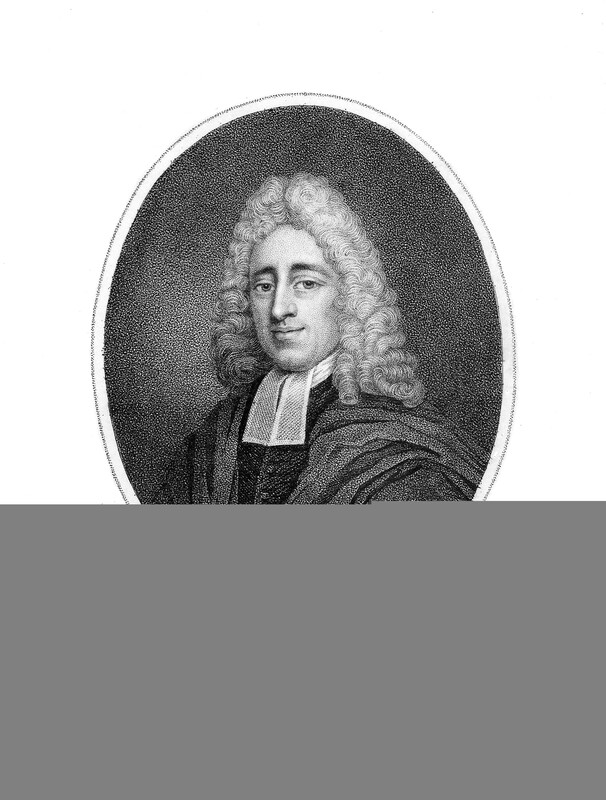 Gervase Markham, The English House-Wife, 5th ed. (London: Anne Griffin, 1637), 77. Andrew F. Smith, “Sangria,” The Oxford Encyclopedia of Food and Drink in America 3, 2nd ed. (New York: Oxford University Press, 2012), 197-98.